Just focused on this. So farming interests want to delist Southern Resident killer whales as an endangered species because they want to pump more water out of the salmon rivers (which pressures salmon populations, which in turn puts pressure on the SRKW population). Their argument, according to this report (and, yes, I am paraphrasing): SRKW are not that genetically distinct from other killer whales and there are lots of killer whales around the world, so who cares if they disappear from Puget Sound. SEATTLE — The federal government is reviewing whether Puget Sound orcas should keep their endangered status. NOAA Fisheries said Monday the review was prompted by a petition from the California-based Pacific Legal Foundation(PLF) seeking to delist the killer whales from the Endangered Species Act. The petition asserts that orcas aren’t in danger of becoming extinct because they’re part of a larger population of thriving whales. 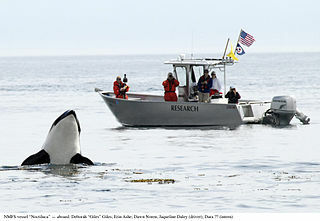 NOAA listed southern resident killer whales as endangered in 2005. The orcas frequent Washington’s Puget Sound. They also spend time in the open ocean. There are currently 86 of these whales. The agency has a year to decide whether it should delist the orcas. It says accepting the petition does not suggest a proposal to delist will follow. The petition was filed in August on behalf of the Center for Environmental Science, Accuracy, and Reliability, as well as two California Central Valley farmers. PLF says that the farmers’ water supply is threatened by the orca’s ESA listing. I’m tempted to point out that the existence of killer whales in Puget Sound is an enormous benefit to coastal communities. So PLF is proposing to enrich one industry at the cost of another. But I don’t want to put this thing on pure economic terms. Instead I want to simply ask: is making money more important than preserving this? this is terrible. humans want to destroy everything, their own world just for the money. only 86 srkw are not considered endangered? to me they are more than endangered, they are on the brink of extinction and do they know that orcas populations are different distinct species around the world?i think that as humans, we really lost it, we took a dangerous path . i don’t believe this…as i do not believe that in Doha , at the summit for climate change, countries like China India Brazil refuses to lower their co2 emissions and also USA doesnt seem to care too much (according to what i’ve heard on television)…it is shocking how we do not care at all because we want to make money now, who cares what’s happening in the future. But what about our children and our childrens’ children??? who do we have to complain to , when our homes gets flooded, or there is too much drought, or our roof is taken apart by another storm? mother nature???? and on top of this: where is the INFORMATION ??? people need to be informed on these subjects…where are the media? Are we to expect a challenge next to the protection status of the beluga whales of Cook Inlet, Alaska? After all, even if they are only in their low hundreds there now, there are plenty of other belugas whales around the world aren’t there? Look at Russia for instance – around the Sea of Okhotsk. But be quick…they may well have sold off the entire stock there to the Georgia Aquarium (with the tacit approval of NOAA) if you don’t hurry!